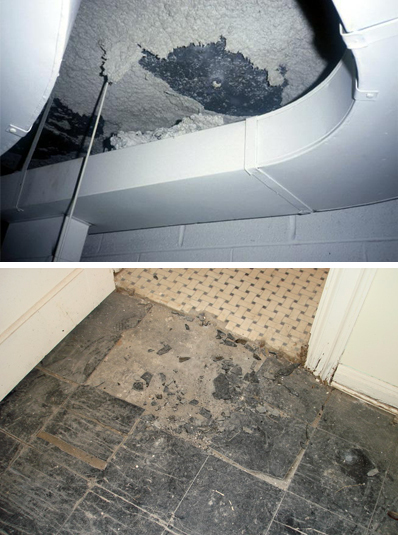 Asbestos is the common name for six different naturally occurring hydrated silicate minerals. They are composed of long, thin fibrous crystals. Many can be mined and manufactured into an array of construction materials and commercial products. Asbestos is characterized by fibers or bundles of fine crystal fibers. This fibrous material is durable, incombustible, chemical resistant. It has excellent insulation and acoustic properties. Asbestos characteristics make it an excellent additive for many building materials used in schools, hospitals and other public buildings. These same characteristics, particularly the durability and small fibrous shape, also make asbestos an unusual environmental contaminant. Widespread use of asbestos in the building industry began over a century ago. Nearly all homes, residential buildings and commercial buildings constructed from the late 19th century to 1980 contain asbestos in some form. Asbestos -- Who Is At Risk? TJL Environmental Health Consultants, Inc. is a Central Virginia Asbestos Testing and Inspections company. We provide asbestos consulting services in Charlottesville, Lynchburg, Roanoke, Culpeper, Richmond, Harrisonburg VA and surrounding communities. To learn more about our Asbestos Inspections and Asbestos Testing, contact us in Charlottesville at 434-962-8721 or 434-977-1409.